Smith and Nephew Allevyn Non-Adhesive Wound Dressing from HealthyKin.com has a unique tri-laminate structure made up from a non-adherent perforated polyurethane wound contact layer, and an outer film layer which is both bacteria-proof and water-proof. The perforated wound contact layer allows even viscous exudate to pass into the dressing. The hydrocellular core of the dressing absorbs and retains liquid in its microscopic structure. The breathable outer surface of the dressing allows excess moisture to evaporate away from the dressing. The result is the formation of a wound environment, which allows healing to progress. Allevyn Non-Adhesive dressings have a polyurethane wound contact layer which prevents adherence to a full range of wound types. The outer, pink layer used on Allevyn Non-Adhesive dressings is a breathable film. This allows the formation and maintenance of a moist wound healing environment at the wound surface, preventing eschar formation. The pink film is also waterproof and assists in preventing bacterial strike through. Allevyn Non-Adhesive dressings are recommended for wounds surrounded by sensitive skin, such as venous leg ulcers. The lack of adhesive allows the use of the most suitable retention method, for example, tape onto intact skin, appropriate bandaging or a film dressing such as OpSite Flexigrid. Allevyn Non-Adhesive dressings are conformable and can be cut to suit various wound shapes and locations. As Allevyn Non-Adhesive dressings absorb exudate, they may swell slightly, but do not leave debris in the wound. Dressing changes are therefore easier for the nurse and less traumatic for the patient; wound irrigation can be kept to a minimum. The progression of exudate through the dressing is visible through the pink top film. 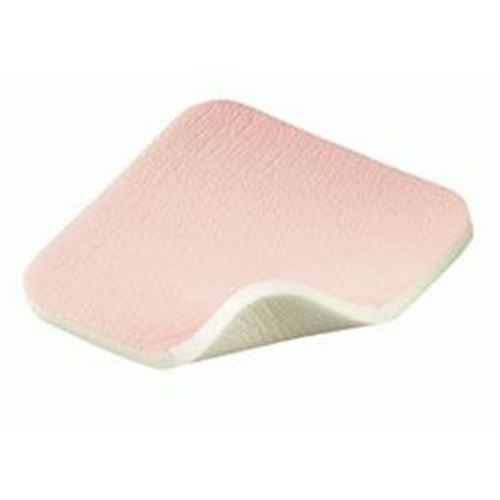 Allevyn Non-Adhesive dressings are soft and cushioning, giving excellent patient comfort and protection. This product has been very helpful to me in healing a pressure ulcer on my big toe. My podiatrist says it looks better each time I come in. I have been using this dressing for my son since 2011 ot does a great job and this company has the best price on for it. This has been a great product for dressing an ulcerated big toe over a long period of time. It's Non-adhesive property works very well. Weekly dressing changes are a bonus too.